Throbbing Gristle, the uncontested pioneers of neo-punk electronic hoop-de-doo, will be making a stop at Veteran's Auditorium, 4117 Overland Ave., This Friday at 8 p.m., one of only two dates they'll be playing in this country. When you're talking INDUSTRIAL NOISE you're talking TG (they've even got their own label, Industrial Records), but their music, an even more radical restructuring of the old rock-roll corpse than PIL (whom they predate by a good two years) actually covers the entire gamut from said noise to functionally scary synthesizer hotstuff to voice-of-the-whales to (dig this) neo-Abba. With subject matter from deep within "the heart of the beast," they're at least as tour-de-force-y a watershed for what's truly in store as the Velvet Underground were in '67 (true). I wouldn't be surprised to see 'em bring along a (Burroughsian) infra-sound generator (y'know the kind that can allegedly kill, but their bark is worse than their bite and they're basically a bunch of loveable humanists, the first - and most potent - in the long line already forming of 'last gaspers against the techno fascism which will soon engulf us'. All this plus Vox Pop and SWA. Throbbing Gristle's concert Friday night at Culver City's Veteran's Auditorium was an underground event of the first order. 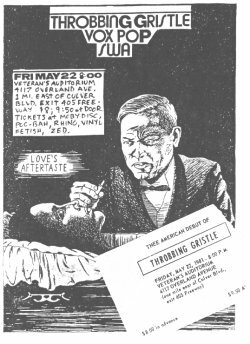 Besides the group's status as guiding light for a whole experimental-music movement in England, there was the fact that this was Throbbing Gristle's first and last Los Angeles appearance. After a San Francisco concert this Friday, the group will shelve its musical endeavors to concentrate on video projects. Throbbing Gristle originated the "industrial music" concept that's influenced many of the artier "modern" bands, and while TG's music has at times moved toward more conventional-sounding song formats, Friday's show was centred on a driving, relentless factory noise that assumed various rhythms as the set roared on. While the four players use instruments like bass, guitar and electric piano, everything is treated electronically, resulting in a thickly layered, miasmic sound. When Cosey Fanni Tutti blasted out some high notes from her cornet, it was as though free-jazz had been mated with some monstrous machinery. This kind of thing can become tedious, or cold and remote, but TG's leader Genesis P-Orridge fronted the group with a fierce intensity, lending the performance its immediacy and spontaneity. P-Orridge gyrated like an actual rock singer, slapped his bass guitar around, and prowled into the crowd to converse with the fans. Like all the vocals, these were transformed into ghostly scraps of sound sucked into the prevailing noise. With its strong beat, this noise was engaging and exhilarating. And for a group whose records and writings reveal grim obsessions, the whole presentation had a surprisingly positive air. After exactly 60 minutes, Throbbing Gristle shut everything down, but remained for an hour or more talking pleasantly with the fans who poured onto the stage at show's end.